Ruth has a chipped tooth, and a chipped tea cup, but she doesn’t let it bother her, preferring instead to play and run on the beach. 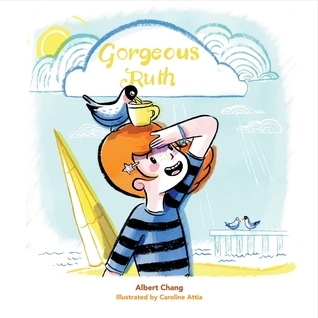 This picture book has beautiful illustrations with billowing lines and colorful figures. I really loved the movement in the pictures, and how cute Ruth looks! She looks sweet and cheerful on every page. The sweeping wind and rushing waves are the perfect backdrop for the energetic Ruth, but I also enjoyed how peaceful the artwork is as Ruth lays down to sleep. The one thing I did NOT enjoy was the actual story. It was not exactly clear what the relationship was between Ruth’s chipped tooth and the broken cup. Did she chip her tooth on the cup? Or is she just comparing her tooth to the cup? And most of the rhyming was there simply because it rhymed. It didn’t actually enhance or explain the story. “Gorgeous Ruth, whose life shines with truth.” In what way is it necessary for the reader to know that Ruth is truthful? How is that relevant to the chipped tooth? None of this connects! They just threw it in, because it rhymes with “Ruth”. “Dear Gorgeous Ruth, who champions youth.” Seriously? Does the concept of youth need a champion to defend it? Or is there another “youth”, a child somewhere, that Ruth needs to protect? What does that even mean? “She shines with life, bereft of all strife.” Since the word “bereft” carries the connotation of grief or violence, I don’t see how that is a proper word to describe not having strife. Besides which, why are words like “bereft” and “strife” in a children’s book at all? Are little baby geniuses with massive vocabularies reading this book? Lovely illustrations. Lazy poetry. Bad storytelling. Disclaimer: I received an ecopy of this book from the author/publisher via Reedsy in exchange for a free and honest review. All the opinions stated here are my own true thoughts, and are not influenced by anyone.